Home → CANDLES → Scripture Tins → New Fragrance! 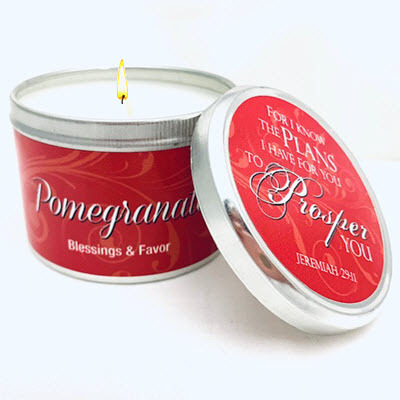 Pomegranate Scripture Tin -"For I know the Plans"
Be encouraged and uplifted with this hand-poured, all natural, soy blend Pomegranate candle, accented by the scripture verse from Jeremiah 29:11 "For I know the PLANS that I have for you to PROSPER you...". In the spiritual sense, Pomegranate speaks of the blessings and favor of the Lord!